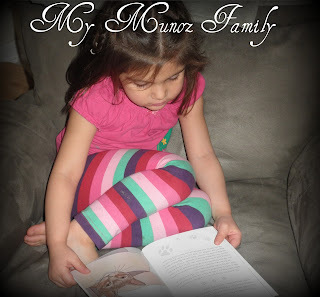 I love to read books to Bella & she LOVES to hear me read them and see the pictures. It's become a nightly tradition in our house to read one story or book a night before bed. So, when I was asked to do a review on a children's book called Mr. Bo Finds a New Home & Name by Timothy Battle, I was ecstatic! First thing I did was to look at the illustrations throughout the book. I know Bella only likes books with "pretty pictures" and knew she would adore this book, because they are wonderful! Let me sum the book up as best I can... It's about a cat named Linus that was in a shelter waiting to be adopted. He sees a man come in that he knows will be his new owner, so he does everything he can to get the man's attention. Linus wants to find his own home & change his name. It's such a great book about adoption & loving someone or something so much. It seems like it would be a great book for parents of foster/adopted children to read to them and show that they are loved by their parents, no matter what. It also shows kids that we love and take care of our pets like they are children. Bella knows to be nice to our puppies, but I think now she gets that they are also family, not just pets. I thoroughly enjoyed reading this book to Bella & she loved to listen to it and look at the pictures. It has now become a staple in our nightly book section of her bedroom! Bella reading her new book! This book is for purchase at your neighborhood bookstores. You can also order this book on Amazon.com or download it for your Kindle or IPad! 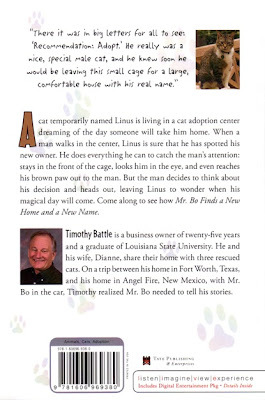 One of my readers will win their very own SIGNED copy of Mr. Bo Finds a New Home and Name by Timothy Battle! Tell me why you think this book would be perfect for you and your family! EVERY entry must include your email address! Additional Entries: One entry for each! 1) "Like" My Munoz Family on Facebook & leave a comment on my page stating your entry! 2) Follow My Munoz Family on Twitter & tweet about this giveaway! You can tweet once a day for each additional entry! 4) Like Mr. Bo on Facebook & leave your name on the entry! Once the winner is announced, I will email them & the winner will have 48 hours to respond. If no response is sent by 48 hours another random entry will win. Good luck and thanks for entering! Giveaway ends March 9th @ 7 p.m. CST! ﻿Disclaimer: I was given the opportunity to review Mr. Bo Finds a New Home & Name from Kailani, and was given a copy of the book in order to review. I was not compensated in any way to write a good or favorable review. All opinions expressed are that of My Munoz Family. My son is 4 and I really encourage reading..so this would be great for him! Hi, found your blog from My Life as a Mom and Wife's blog hop. Your baby is adorable! Cute family and cute blog. I know about working full time and blogging, whew. But I love it too! Following you on twitter and fb, too. Mr. Bo & I Thank you for the great Review on our book. My little one loves animal books. He would be thrilled with this. We would love to add this to our collection : ) This would be perfect for Alex. 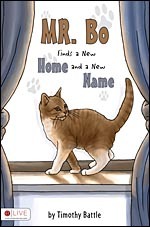 As a Special offer to your followers, Mr. Bo and I would like to provide a special personalized & autographed copy of "Mr.Bo Finds a New Home and a New Name." My little guy loves animals. He would really love this book.